MdDS may be invisible, but we can see the effects it has on us very clearly. August 25th, 2003 was the day that temporarily forever changed my life. At least that’s what the doctor in San Francisco General thought—“temporary”. 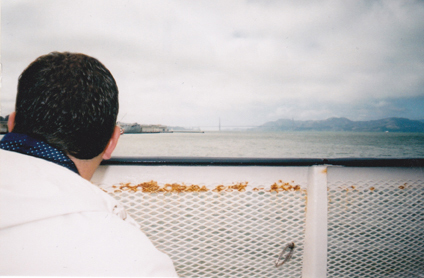 Who would have thought that a simple boat ride in the Pacific Ocean to the now touristy Alcatraz, a place where hopes and dreams went to die, would be a place my own hopes and dreams went to die. I was just trying to celebrate my youth as a 23-year-old man who had just gotten married and wanted to see some history. But, as fate would have it, an invisible illness had other plans for me that day. I awoke just like any other morning when you’re on vacation—I was bright, cheery and motivated to see what the day had in store for me. But on my way to the bathroom, something felt “off.” Why did the floor feel like it was made of cushioned foam padding? Why did it feel like I was walking on a trampoline? Why was I swaying slightly, looking for something secure to grab? I was in San Francisco… was it an earthquake? Thinking nothing of it, and perhaps my mind playing some west coast tricks on me, I got dressed and woke my wife up. I didn’t even mention the sensation I was feeling. I just wanted a good day. As we navigated our way through the city, grabbing lunch and seeing some sights, we sat on a grassy ridge and just talked—soaking in the day’s beauty. I just couldn’t hold in my concerns anymore regarding my “brain fog” and “body sway.” I told her what I was feeling and I told her something was wrong. She, being the concerned person she was, immediately brought me to the hospital. There, I was given a quick diagnosis of Labrynthitis! Simple enough. Take meclizine for the motion and you’ll be fine within a week! “It’ll pass,” they said. I’m now 36-years-old, and it’s 2015, and I still have Mal de Débarquement Syndrome or MdDS as it is commonly referred to within our bobbing and swaying community of sufferers. In the last 13 years, I’ve gone through just about every test and seen just about every doctor this planet has to offer me. And while I appreciate doctors in general, mostly all of them had no clue what I was talking about, nor did they give me any hope to work with. For the first several years after coming home from my trip in San Francisco, I lived in fear. I lived with hopelessness. I lived with uncertainty of what I even had. I was fearful. I was angry. I was lonely… I was losing my mind. No, really. I was Losing. My. Mind. Once, during those first several years, I actually had a mental breakdown in my living room. My wife became frightened with my behavior. I seriously had thoughts of ending it all. I couldn’t be on this “boat” any longer. So, fearing my unstable conduct, she brought me to the hospital where they sedated me enough to calm me down. There’s a saying I picked up once that said, “If you don’t have your health, nothing else matters.” Never in my life had I thought something like that until I had to deal with MdDS. Nothing else did matter at that time. Finding a diagnosis and cure was just as important as breathing to me. And that’s when television happened. I was flipping through the channels and a program came on titled, “The Woman Who Wouldn’t Stop Rocking.” In a nutshell, that television show changed my life… again. I literally knew what I had while watching that woman share her story. This is what I had. Shortly after that show, I was lead to the Internet, where, and by no small miracle, I found the mddsfoundation.org website. Everything, I mean everything started to make sense. I found an MdDS doctor outside of Philadelphia who I managed to see. I found out I wasn’t alone having this terrible affliction. I read numerous other stories from people just like me who were carrying this burden of fear and uncertainty. Around this time, my wife and I had our first child—a boy named Cameron. He’ll never fully know the spark he provided me—the motivation he instilled in me to want to live, even through this debilitating condition I had. I needed to live and live my best… for him. I had to be a Dad now, and I loved the fact that I was. I made connections with fellow MdDSers and learned about varying medications others used, as well as homeopathic remedies for reduced symptoms. Through sharing of vital information, I discovered a doctor at UCLA, Dr. Cha, and another doctor in New York, Dr. Dai, who are pioneering research and trial testing for a cure. They are actual doctors who are dedicating their craft and practice to my illness—an illness that was invisible, rare and under funded. I had actual human beings who cared and wanted to help. In 2010, my beautiful daughter, Aubrey Shea was born, growing our family, and invigorating my zest for life, despite the daily battle that I struggled with. My kids, my wife, my friends, those doctors and my newly established MdDS community gave me the fight to bust through the loneliness. They gave me the fight to tell MdDS that it wasn’t going to beat me. And that’s what it is—it’s a fight. I don’t live week-to-week or year-to-year any more. I live day-to-day. I wake up, walk to the bathroom like I did 13 years ago with the floor wobbling and my feet bouncing, but the difference now is I know what I have, I know what I have to do, and I know I’m not alone. My advice to you, the sufferer, is, find your purpose. Find what it is that makes you want to fight this. Maybe it’s your children? Maybe it’s your friends? Maybe it’s your career? The point is we have so much more information than we had in 2003. We have so many more people fighting for us. There are reasons to live with this and not give up. Pick something out that you’re passionate about and fight for that. Several years ago I tapped into what I love doing, which is writing, and I published a book. I continue writing and speaking to schools and kids. I found my passion. MdDS may be invisible, but we can see the effects it has on us very clearly. Don’t be alone. If you feel badly, tell someone. Don’t keep it in. Outsiders don’t know how we feel based on how we look. Seek help. Seek your purpose. If you can feel better, even just a little bit, on your darkest day, you’re winning the fight. Thank you so much Stephen for your story. My husband is 30 years and he has had MdDS for 3 months now. I saw you mentioned homeopathic treatments, could you elaborate on anything that’s helped? Thank you Stephen for telling your story. You give us all “Rockers” strength and hope! Anna, hi. I just keep fighting the good fight! Thanks for your comment! Appreciated! This is great! It must be a subject that many of us that have a chronic illness think about a lot. I also wrote about my purpose (and I swear I hadn’t seen your blog yet). Keeping on writing! Hi Shari – thanks for the comment! Stop stealing my blog ideas! 🙂 I’m just kidding! Hopefully all of us can find our purpose! beautiful! Thank you so much for putting your heart out there. It makes me feel less alone. You’re never alone. It took me a while to realize that, but it’s true. Fight for your purpose! Thank you for telling your story. I have seen your messages through the group’s site, but now I feel as if I truly know you. Your story is so beautifully written. You can definitely tell you have the God given gift of a writer. You brought me to tears. For those of us that have suffered with MdDS, you described the feelings exactly as we have felt and lived them. I am so sorry that you have suffered with this horrible, debilitating syndrome for so long and that it continues. Yet, you have fought to find your purpose. Your advice will help so many by just letting them know they are not alone and it gives them encouragement to be a fighter in order to win. It is amazing that with the symptoms that you have that you are able to write a book, have it published, and speak to schools and kids, along with raising a family. I greatly admire how you have handled this adversity and have reached out to others. You are an inspiration. Wow! I am humbled and flattered by your response. I’m no different than anyone else though. Just remember, it’s not the size of the dog in the fight, it’s the size of the fight in the dog. Thanks so much again for the kind words!